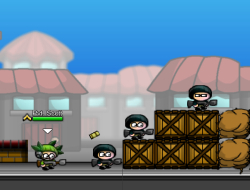 This is a fun action game in which you will be a lone wolf sent in the city to battle all the other soldiers. They arent fighting for a just cause so they must be stopped. Use your high mobility skills and your guns to take them down. With each level, the headquarters will pay you some nice amounts of money and you should use them to get new gear for your fighter. Remember to shoot precisely so they dont even get a chance to see you and they will be pulverized. Try to get medals in each mission so the bosses will be more generous with the payments. City Siege 10.00 between 0 and 10 based on 2 votes.